Cambridge seems to have moved from hot toddy weather to home-made lemonade weather rather quickly this year, as our cold spring has given way to a scorching June. In between the recent thunderstorms, the Solent has been witnessing the biggest show of sea power in British waters since the Normandy invasion of 1944. Whilst the Review of the Fleet was in honour of the 200th anniversary of Nelson's victory at the Battle of Trafalgar, I couldn't help but notice that the Polar Regions were very much at the centre of things, for pride of place was given to HMS Endurance. In her striking red and white polar colours, Endurance stylishly carried the Queen through the throng of warships, accompanied (appropriately) by the naval survey vessel, HMS Scott, carrying the Prince of Wales. Few, in this country at least, can not now have heard of the Endurance and her unique role in the Polar regions. The long traditions of the Royal Navy in Polar exploration continue to this day. This was a timely reminder of the fact because, of course, the Friends are shortly to have a rare opportunity to visit HMS Endurance whilst she is being re-fitted in Portsmouth. This complimentary tour, arranged through Philippa Foster-Back, still has a few places left on it, so please contact Ann Bean at once if you wish to join this excursion. The HMS Endurance visit will conclude a rather busy Spring for the Friends. 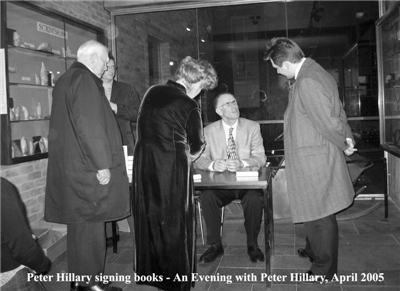 The Evening with Peter Hillary was a huge success, with several Friends complaining to me that their mascara was running because they had been laughing so hard! The Polar Book Den and Summer Lunch were likewise greatly appreciated and whilst the Songs of the Morning concert could have been better attended, it was a hugely enjoyable evening, with enthusiasts from Northern Ireland and Aberdeen travelling to Cambridge especially for the performance. The Institute has been busy too, with the very successful exhibition of Antarctic paintings by Edward Seago opened in person by HRH the Duke of Edinburgh. By the time that you receive this, most of the paintings will have been returned to Balmoral and preparations will be underway for the autumn exhibition of Ponting photographs. The end of term means that many of the Institute's scientists will be away doing fieldwork in the Arctic for the Summer, so we are heading towards a relatively quiet time in the Institute itself. The Friends will start our autumn programme of activities on Saturday October 1st when Aidan Dooley comes to perform his widely acclaimed one-man play Tom Crean, Antarctic Explorer. A booking form accompanies this issue of Polar Bytes and I cannot commend this performance to you in high enough terms - it is a remarkable play, so do take the opportunity of seeing it. In attending the play, and bringing your friends, you will also be helping to raise funds for the William Mills Library Acquisitions Fund appeal. The total for the Mills Fund now stands at £41,100.84. We are just £9,000 short of our target. I am therefore hoping that the entire membership will make one last big effort to raise this relatively small sum. Please send whatever contributions you can, so that we may successfully close this appeal. Finally, you should all have received a letter explaining changes in the membership structure of the Friends, along with a copy of the new Friends' membership leaflet. I hope that these changes meet with your approval and will allow for the continued development of the Friends. Your comments and ideas towards this end are always welcome. So now that we have wonderful new membership literature - please, let us go forth and multiply! Friends, please find a Friend! 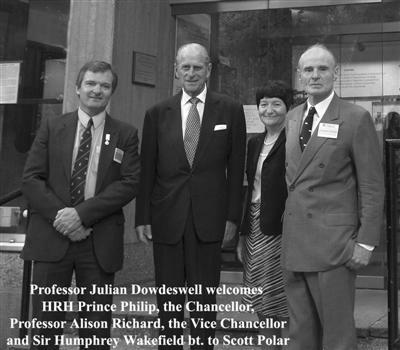 The Institute and the Vice-Chancellor of the University of Cambridge were hosts to HRH The Duke of Edinburgh on 21 June. His Royal Highness, in his role as Chancellor of the University, was present in SPRI to open formally an exhibition of paintings by Edward Seago. The twenty-five oil paintings of Antarctic landscapes and seascapes were kindly lent from the Duke's private collection, and were painted when Edward Seago was a guest aboard the Royal Yacht Britannia over the austral summer of 1956-57. This is the first time that these splendid paintings, together with an additional one given to SPRI by Seago, have been exhibited publicly. Most are usually on the walls of Balmoral Castle. For those of you who might not know I am pleased to tell you that the Institute has recently purchased the archive of Peter Mott in a Bonhams' sale. The purchase of this important archive was made possible by a grant from the Friends of the Institute for £2160 and the Institute is, as always, grateful to the Friends for their support. Peter Mott was the Chief Surveyor of Hunting Aerosurveys Ltd. and was appointed the leader of the two Falkland Islands Dependencies Aerial Survey Expeditions, 1955-56 and 1956-57, which mapped large parts of the Antarctic Peninsula. The archive consists of numerous papers, photographs and artefacts from this important period of British Antarctic survey work. Friends will also be pleased to hear that the Arts and Humanities Research Council has granted £30,000 to the Institute to fund the web-cataloguing of SPRI's Arctic ethnographic and photography collections. Once executed, this work will considerably enhance public access to much of our Arctic collection. The Museum has also now received its 'registered status'. Registered status is a badge awarded by the Museum, Library and Archives Council to show that we comply with nationally agreed codes of practice for Museum collections. The Friends are currently concentrating our fund-raising efforts towards The William Mills Library Acquisitions Fund in honour of the late librarian, and which contributes to the main appeal. The Fund currently stands at a figure of £41,100.84 towards our target of £50,000, with donations received ranging from £5 to £5000. Please send contributions (payable to the University of Cambridge) to: The William Mills Library Acquisitions Fund Appeal, Scott Polar Research Institute, Lensfield Road, Cambridge CB2 1ER. Reports are suggesting a significant increase in tuberculosis in the remote Yukon-Kuskokwim region of Alaska. TB had devastating effects in Alaska during in the 1940s and 50s, particularly on native populations and health officials fear the resurgence of the disease which is already causing havoc with native populations in the Russian Arctic. Across the Arctic region, lakes and ponds are beginning to shrink and disappear, as a warmer global climate dries out the northern landscape. Scientists say the loss of surface freshwater across the Arctic portends a dramatic ecological shift with unpredictable consequences. Native leaders from Arctic regions recently met with leaders of the European Union and asked them to do more about climate change and to consider giving aid to indigenous groups that are being harmed by it. The head of the European Environment Agency (EEA) has recently suggested that the middle of Europe could become crowded by "climate change refugees" escaping a thawing Arctic to the north and Mediterranean droughts to the south. Meanwhile, oil companies have won the protracted battle for the right to drill oil in the Arctic National Wildlife Refuge, despite serious concerns regarding key wildlife populations. The battle for oil drilling rights has now moved to two other protected areas, Teshekpuk Lake and the Yukon Flats National Wildlife Refuge. In other Arctic fossil fuel developments, a Russian research vessel recently towed a 200,000-tonne iceberg to a new location, out of the way of a project to develop gas deposits in the Barents Sea. Elsewhere, the 6th World Ice Golf Championship was played at Svarlbard 1,000km (621 miles) north of the Arctic Circle. Armed guards protected the golfers from the possibility of encounters with polar bears, which was probably just as well. Svarlbard has recently had a spate of cabin break-ins with hungry bears breaking into properties in search of food. The four-legged burglars have now trashed more than ten cabins. A recent report from the Royal Society suggests that marine species are under threat from rising levels of acidity in the oceans. The report: Ocean Acidification Due to Increasing Atmospheric Carbon Dioxide, suggests that the world's oceans have already absorbed about half of the CO2 produced by humans, mainly by the burning of fossil fuels, over the past 200 years. The Report suggests that sensitive plankton species in the Antarctic Ocean, which are a major food source for fish and other animals, are likely to be amongst the first casualties. This report coincides with other major scientific reports showing that almost 90% of glaciers on the Antarctic Peninsula are now losing mass. However, the Antarctic Ice Sheet appears to be growing in Greater Antarctica. Scientists are now wondering whether this thickening may mitigate any sea level rise due to the melting of the Peninsula glaciers. Meanwhile, British scientists have been given the go-ahead for a project aimed at dropping a robot probe 2 miles through the ice into Lake Ellsworth in Lesser Antarctica and to study sediments on its floor. The latter could provide vital information about climate change. Russian scientists have meanwhile announced that they will resume drilling into Lake Vostok, to within 100m of the waters that sit below its ice-cap. The ultimate goal is to reach the lake waters under the ice, which is currently anticipated during the 2007-8 season. Major conflict continues to be threatened in Antarctic waters after New Zealand, Great Britain and the United States made a protest to the Japanese government over their annual whale hunt. Whilst the Japanese lost a vote at the recent International Whaling Commission meeting to extend their "scientific" whaling catch to Humpback Whales, they are likely to go ahead anyway. Australian vessels were threatening to physically stop any such hunt but have been warned by the Australian Attorney-General that they may be liable to charges of piracy. The recent Antarctic Treaty meeting in Sweden has passed the Stockholm Annexe to the Environmental Protocol. This ensures that any party that is responsible for polluting Antarctic waters or causing other environmental emergencies on the continent will now be legally bound to pay for the clean-up operation. The annexe will hold individual operators or nations responsible for taking immediate action after an environmental disaster. If no action is taken, the responsible party will be liable to compensate other groups for clean-up operations. However, before the new agreement takes effect, each of the 28 Consultative Parties must ratify the annexe through domestic legislation. Meanwhile, real-estate development in the Antarctic continues with the Australian Government approving the building of an ice runway to support Australia's Casey Station and the United States planning the continued development of a 'road' to the South Pole Station. We are very grateful for the support of Peregrine Adventures for publicity towards the Tom Crean evening and for supporting this issue of Polar Bytes. Peregrine are one of the leading Polar tour operators, and have been organising specialist visits to the Polar regions for some years. Further details at www.peregrineadventures.co.uk. Their support of the Friends is greatly appreciated. We are also very grateful for the substantial support of the Courtauld Trust towards the work of the Friends. We recently received a cheque for £2,400 from the Trust, £1,400 of which is for restoration work on the photograph albums of the Arctic Air Route Expedition (1930-1931) in which Courtauld himself participated. The Courtauld Trust and Peregrine Adventures have now been recognised, along with Discover the World, as Executive Friends. This is a recently developed designation to recognise major contributions received from companies and Trusts towards our work in support of the Institute. You can find out more on the Friends' newly refreshed web-pages at www.spri.cam.ac.uk/friends which also carry all the latest news on Friends' activities. 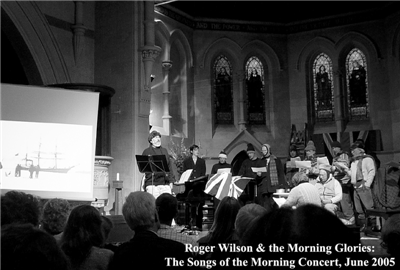 We are also grateful to Hoopoes Ltd. (www.hoopoes.com) & Reed T & Son (22 Castle Street, Saffron Walden) for their support towards the Friends' Songs of the Morning concert. An Apology is extended to all of those members who recently received letters from the University's Foundation Office regarding their subscriptions, gift aid etc. The first that we knew about it was upon receiving queries from members and we deeply regret any distress that has been caused. This was a University clerical error. Members should ignore any such correspondence unless it comes from the Friends Secretary. Peter Clarkson retires: On June 18th, after many years of service as Executive Secretary to the Scientific Committee on Antarctic Research (the Secretariat of which is based in the Institute) Peter Clarkson took his retirement. The Friends congratulate Peter and look forward to welcoming his successor, Marzena Kaczmarska, to the Institute. 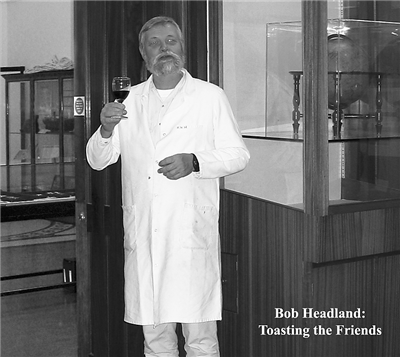 The Friends Annual General Meeting and Autumn Buffet Supper will take place on Saturday 12th November 2005, following a lecture by Rob Stephenson. There are still 6 places left on The Great Sponsored Arctic Dog Sledge in Norway in March 2006. We require more volunteers to sign up urgently - so please think of anyone you may know who would like to take part - persuade them to sign up - and put them in touch with me. Friends Committee: This December two members will, by rotation, retire from the Committee. We are, therefore, seeking nominations. Should you wish to nominate someone please, as per Article 5(v) of our Constitution, send a letter of nomination together with the names and addresses of two seconders and a letter of agreement to serve from the nominee. Please forward nominations to Ann Bean by 30th September - these may be sent by e-mail to friendsofspri@aol.com with paperwork following thereafter. Passing Friends: We are very sorry to note the deaths of the following: Angela Mathias, the widow of Apsley Cherry-Garrard, whose account of his experiences on Scott's final expedition in The Worst Journey in the World became a classic of Polar literature. She nursed Cherry for much of his later life and was a Friend for many years. Elsewhere, we also note the death of the actor Sir John Mills, who played Captain Scott in the 1948 film, Scott of the Antarctic and Gwion Davies, the "handyman" of the Second World War Antarctic expedition, Operation Tabarin. A very warm welcome is extended to all of our new Friends.